Luxury retailer Bulgari’s new, 15-year lease at Wharton Properties and General Growth Properties’ 730 Fifth Avenue set a new city record with rents in excess of $5,000 per square foot, according to industry sources. Sources said the deal’s total value, once free rent and other considerations are taken into account, could reach up to $5,500 per square foot, with annual rent in excess of $16 million per year. GGP CEO Sandeep Mathrani announced last week that the Rome-based luxury goods brand signed a new lease “at market rents” for its space at the base of the Crown Building at 730 Fifth Avenue. The deal will see Bulgari maintain its presence on the corner of 57th Street and Fifth Avenue – arguably the most desirable retail location in the city. 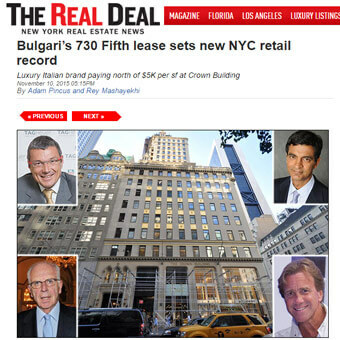 With the Upper Fifth Avenue retail corridor ranking as the world’s most expensive, the Bulgari lease would place among the priciest retail leases ever signed, if not the priciest. Averaging asking rents in the Fifth Avenue retail corridor between 49th and 59th streets were $3,683 per square foot as of this spring, according to the Real Estate Board of New York’s most recent report. While Bulgari’s new deal ensures it will continue at 730 Fifth Avenue for another decade-and-a-half, the retailer will be downsizing notably at the location. Bulgari will be taking less than its current 3,675 square feet on the ground floor of 730 Fifth Avenue, while it will also give up all of its roughly 6,000 square feet of upper-level retail at the store. But the brand is expected to draft noted architect and retail designer Peter Marino to helm a revamping of the space. The terms of the new lease go some way to justifying the nearly $1.8 billion that GGP and Wharton Properties, led by retail magnate Jeff Sutton, paid to acquire the Crown Building earlier this year. That transaction set a record of its own for price paid per square foot for an entire office building — though developers Michael Shvo and Vladislav Doronin’s Amanresorts International agreed to buy the Crown Building’s non-retail portion for $475 million, with plans to convert it into a luxury residential building. © 2016 Wharton Properties, a Jeff Sutton Company. All Rights Reserved. Powered by BlueSwitch.